With Disney’s live-action Beauty and the Beast headed to theaters in the spring, I couldn’t help making a DIY Beast costume. Emma Watson will be an amazing Belle and I can’t wait to see it! Hopefully, Belle would approve of our own little Beast. 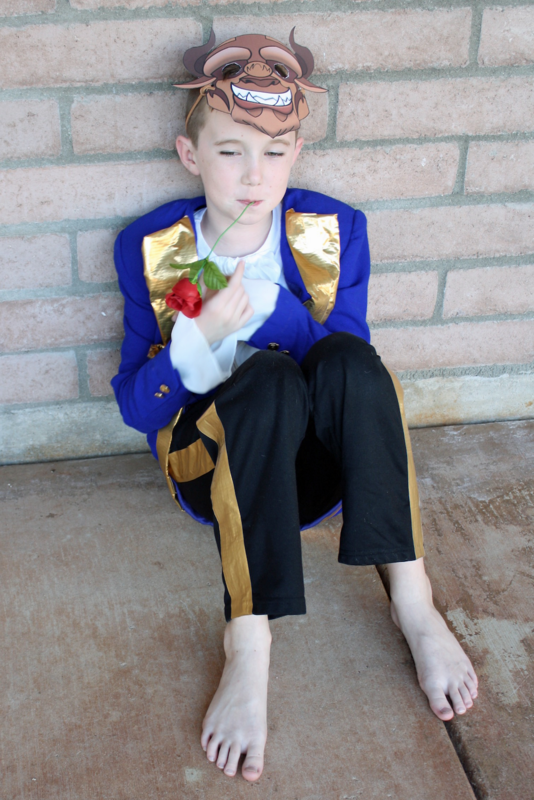 This costume is another easy Disney Prince costume that can be sized up to adults or down to toddlers. It can be no-sew if you like, although I did make a few stitches in my version. Here’s what you need to make your own DIY Beauty and the Beast Costume. I thrifted everything we didn’t have already on hand at home including the most important piece to this easy DIY costume, the blue blazer. I found this petite jacket in the women’s section, it was perfect with gold button accents. I unbuttoned the jacket and pinned the top half open. 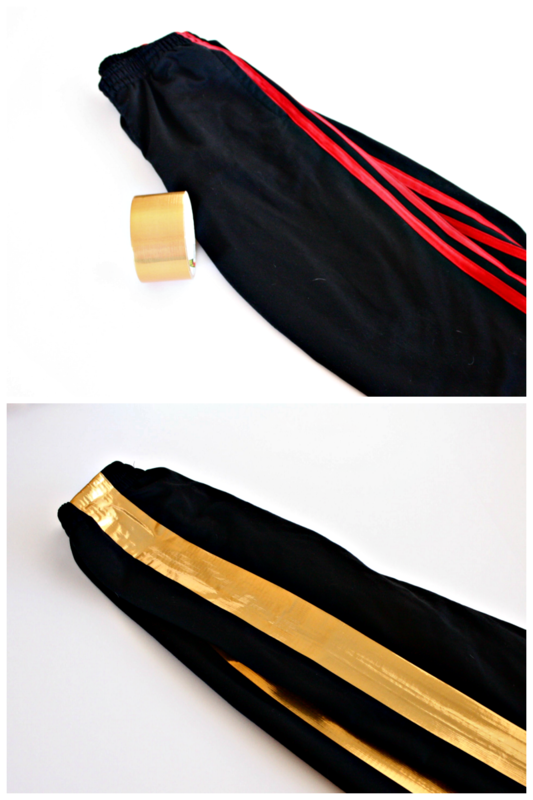 Then covered the jacket edges in gold duct tape. I added gold duct tape to the jacket pockets for extra detail. My blazer came with gold buttons; if yours doesn’t you can replace the buttons or just cover them with gold duct tape. Utilizing more of the fancy shirt, I cut a large section of the material to create the cravat. I slipped a gold button through a pipe cleaner and used it to tie the cravat around the middle. Then I sewed the cravat to the top edge of a white t-shirt. Again you could use a glue gun here but a couple of quick stitches worked well for me. The final piece is the Beast mask. I found some adorable Beast masks on Etsy if you want to order something cute. 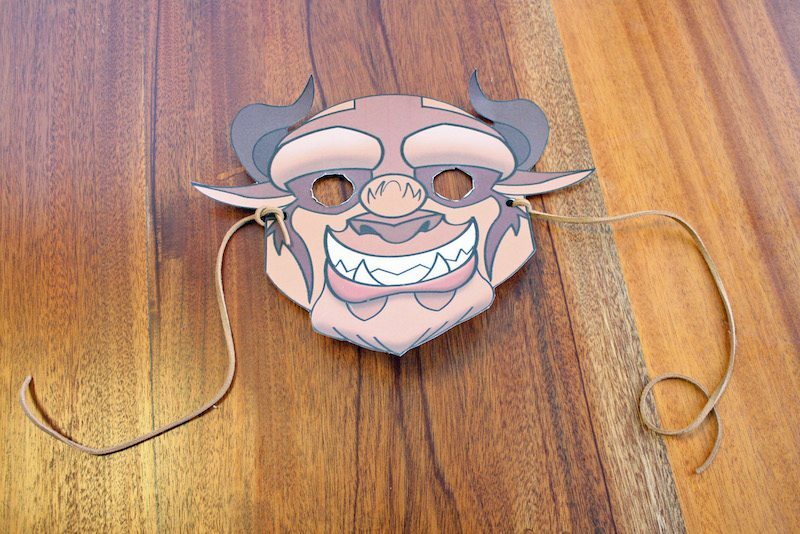 I went with a free printable Beast mask I found online, printed on card stock. Disney’s “Beauty and the Beast” is a live-action re-telling of the studio’s animated classic which refashions the classic characters from the tale as old as time for a contemporary audience, staying true to the original music while updating the score with several new songs. It arrives in theaters on March 17, 2017! Ready to plan a Disneybounding trip to the parks? Let Get Away Today help! They pride themselves on saving families money and helping plan your perfect vacation. Check out their deals on Disneyland and Walt Disney World tickets & packages. My family has booked Disney vacations through Get Away Today since I was a kid, so I know it’s a well-established travel agency. Plus they are a Select Tour Operator with Disney Parks and is approved by the Better Business Bureau. Who else is excited for the new Beauty and the Beast? Great tutorial, I am following this for my sons outfit BUT my duct tape just keeps falling off! Any ideas how I can get it to stay? Maybe it’s the type of material of your blue blazer? Is it silky at all? I actually made two versions of costume and didn’t have this problem but maybe I was lucky with the type of material I was using? If it was me, I’d use my glue gun to help it stay on. I hope it works for you!! Yay!! I am so excited my tutorial was helpful. Thanks for sharing your success!